Can a Tesla Model S make it from Washington, D.C., to Boston without riding on a flatbed truck? A reviewer in the New York Times said recently that he failed to make it, setting off a war of words with Tesla founder Elon Musk, who said the Times review was a "fake." On Thursday, I took the same drive -- and I made it to Boston, though not without some anxiety that I would run out of juice. The key issue is not the car itself, but the location of charging stations, since the Tesla (TSLA) battery pack is good for only 270 miles. The most scary part of the trip: the 200 miles between charging stations in Newark, Del., and Milford, Conn. That's not a lot of cushion, especially after I missed an exit adding a few miles to that leg. Tesla has a load of instructions to maximize battery power, and I think I followed them pretty well. I kept the cruise control pegged to between 60 and 65 much of the way, and kept the climate control at 72 degrees. I minimized stops. I had expected to feel ridiculous all the way from Newark to Milford, with one eye on the rearview mirror watching fast-approaching cars. But I didn't. Instead, I found myself maneuvering around slower cars. I normally spend most of my time on the New Jersey Turnpike out in the left lane going at least 10 or 15 miles an hour faster than I was in the Model S. But sitting in the middle lane, I was keeping up with traffic. I certainly didn't feel out of place -- except for the fact that I wasn't burning any gasoline. When we got to Northern New Jersey, we had a choice to make. We could take the shorter route to Milford -- over the George Washington Bridge and through the Bronx -- or a route 30 miles longer that avoided New York City, and its battery draining traffic congestion altogether. 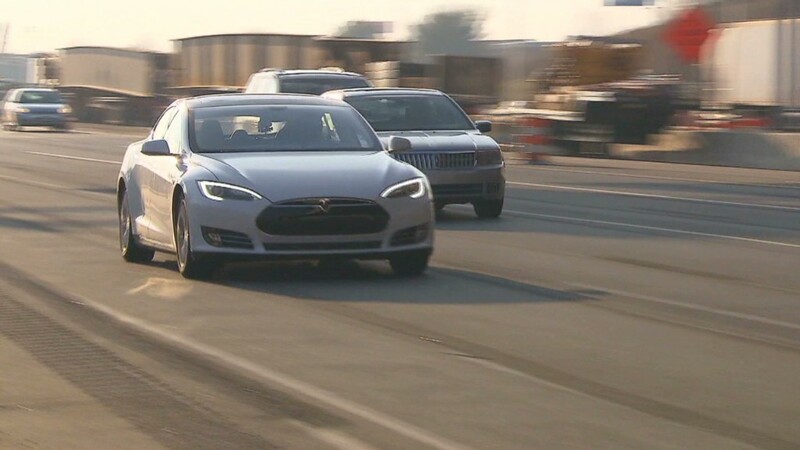 I discussed it with the people at Tesla by phone during the drive, as well as photo journalist Jeremy Harlan and producer Abby Bassett Heffernan, who were accompanying me in a separate car. We opted for the longer route, though the folks at Tesla advised slowing down a little to conserve energy. That seemed smart, until we hit traffic. While it wasn't as bad as the epic parking lot that is the Cross Bronx Expressway, I had gone 30 miles out of our way to avoid traffic and I got it anyway. This did not seem like the road to success. But as I drove into Connecticut, I realized something amazing. Not only did I have enough battery range left, I had plenty. I had at least 40 miles -- more than an entire Chevy Volt's worth of electricity -- left to play with. I sped up, cruising over 70, riding in the left lane, mashing the gas pedal just to feel how fast the car could shoot from 65 to 80. I was practically giddy. In the end, I made it -- and it wasn't that hard. Abby took the wheel for about an hour of the final leg as sheer weariness overtook me, but the car was fine. There were some differences with my ride and the one from the New York Times. The weather for mine was about 10 degrees warmer. And I did mine in one day; the reviewer from the Times split it into two. Tesla's working on that, spokeswoman Shanna Hendricks said. But the first priority was to install enough to make this trip, even if you had to take it easy most of the way. But I didn't have to take it that easy, which is good because the Model S provides a pretty amazing mix of smooth and silent performance along with brain-squishing acceleration. So even if you're not driving from Washington to Boston, it's an impressive car, all on its own. As for the Supercharger network? Turns out that works, too.